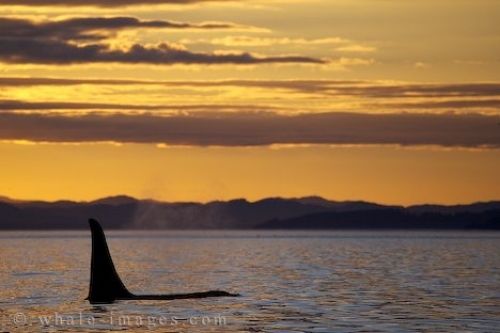 A northern resident male Orca Whale swims peacefully at sunset through Weynton Passage in British Columbia. Some sunsets are outstanding, but having a large male Orca Whale in the foreground tops it all. This beautiful picture was photographed on a cold but beautiful evening after a big storm in Weynton Passage off Vancouver Island. Sunsets are often magic in this area and this one will be hard to top. This photo is one of my very favourite Orca Whale sunset shots, a single male Orca (the rest was ahead of him), probably from the A12 pod just entering Queen Charlotte Sound via Weynton Passage.